Buckingham Palace. This is the principal façade, the East Front; originally constructed by Edward Blore and completed in 1850. It acquired its present appearance following a remodelling, in 1913, by Sir Aston Webb. Queen Victoria, the first monarch to reside at Buckingham Palace, moved into the newly completed palace in 1837. Buckingham Palace (UK /ˈbʌkɪŋəm/ /ˈpælɪs/) is the London residence and administrative headquarters of the reigning monarch of the United Kingdom. Located in the City of Westminster, the palace is often at the centre of state occasions and royal hospitality. It has been a focal point for the British people at times of national rejoicing and mourning. The original early 19th-century interior designs, many of which survive, include widespread use of brightly coloured scagliola and blue and pink lapis, on the advice of Sir Charles Long. King Edward VII oversaw a partial redecoration in a Belle Époque cream and gold colour scheme. Many smaller reception rooms are furnished in the Chinese regency style with furniture and fittings brought from the Royal Pavilion at Brighton and from Carlton House. The palace has 775 rooms, and the garden is the largest private garden in London. The state rooms, used for official and state entertaining, are open to the public each year for most of August and September, and on selected days in winter and spring. 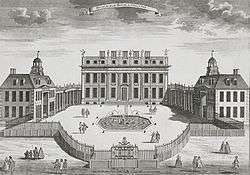 Buckingham House, c. 1710, was designed by William Winde for the 1st Duke of Buckingham and Normanby. This façade evolved into today's Grand Entrance on the west (inner) side of the quadrangle, with the Green Drawing Room above. In the Middle Ages, the site of the future palace formed part of the Manor of Ebury (also called Eia). The marshy ground was watered by the river Tyburn, which still flows below the courtyard and south wing of the palace. Where the river was fordable (at Cow Ford), the village of Eye Cross grew. Ownership of the site changed hands many times; owners included Edward the Confessor and his queen consort Edith of Wessex in late Saxon times, and, after the Norman Conquest, William the Conqueror. William gave the site to Geoffrey de Mandeville, who bequeathed it to the monks of Westminster Abbey. In 1531, King Henry VIII acquired the Hospital of St James (later St James's Palace) from Eton College, and in 1536 he took the Manor of Ebury from Westminster Abbey. These transfers brought the site of Buckingham Palace back into royal hands for the first time since William the Conqueror had given it away almost 500 years earlier. Various owners leased it from royal landlords and the freehold was the subject of frenzied speculation during the 17th century. By then, the old village of Eye Cross had long since fallen into decay, and the area was mostly wasteland. Needing money, James I sold off part of the Crown freehold but retained part of the site on which he established a 4-acre (16,000 m2) mulberry garden for the production of silk. (This is at the northwest corner of today's palace.) Clement Walker in Anarchia Anglicana (1649) refers to "new-erected sodoms and spintries at the Mulberry Garden at S. James's"; this suggests it may have been a place of debauchery. Eventually, in the late 17th century, the freehold was inherited from the property tycoon Sir Hugh Audley by the great heiress Mary Davies. The house which forms the architectural core of the palace was built for the first Duke of Buckingham and Normanby in 1703 to the design of William Winde. The style chosen was of a large, three-floored central block with two smaller flanking service wings. Buckingham House was eventually sold by Buckingham's descendant, Sir Charles Sheffield, in 1761 to George III for £21,000. Sheffield's leasehold on the mulberry garden site, the freehold of which was still owned by the royal family, was due to expire in 1774. Under the new crown ownership, the building was originally intended as a private retreat for King George III's wife, Queen Charlotte, and was accordingly known as The Queen's House—14 of their 15 children were born there. The name "Buckingham-palace" dates from at least 1791. St James's Palace remained the official and ceremonial royal residence. Remodelling of the structure began in 1762. After his accession to the throne in 1820, King George IV continued the renovation with the idea in mind of a small, comfortable home. While the work was in progress, in 1826, the King decided to modify the house into a palace with the help of his architect John Nash. Some furnishings were transferred from Carlton House, and others had been bought in France after the French Revolution of 1789. 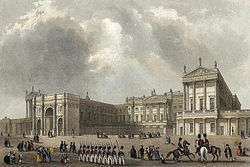 The external façade was designed keeping in mind the French neo-classical influence preferred by George IV. The cost of the renovations grew dramatically, and by 1829 the extravagance of Nash's designs resulted in his removal as architect. On the death of George IV in 1830, his younger brother King William IV hired Edward Blore to finish the work. After the destruction of the Palace of Westminster by fire in 1834, William considered converting the palace into the new Houses of Parliament. Buckingham Palace finally became the principal royal residence in 1837, on the accession of Queen Victoria, who was the first monarch to reside there; her predecessor William IV had died before its completion. While the state rooms were a riot of gilt and colour, the necessities of the new palace were somewhat less luxurious. For one thing, it was reported the chimneys smoked so much that the fires had to be allowed to die down, and consequently the court shivered in icy magnificence. Ventilation was so bad that the interior smelled, and when a decision was taken to install gas lamps, there was a serious worry about the build-up of gas on the lower floors. It was also said that staff were lax and lazy and the palace was dirty. Following the queen's marriage in 1840, her husband, Prince Albert, concerned himself with a reorganisation of the household offices and staff, and with the design faults of the palace. The problems were all rectified by the close of 1840. However, the builders were to return within the decade. 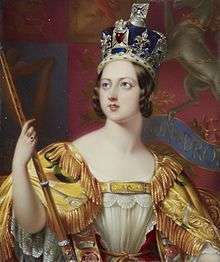 Widowed in 1861, the grief-stricken Queen withdrew from public life and left Buckingham Palace to live at Windsor Castle, Balmoral Castle and Osborne House. For many years the palace was seldom used, even neglected. In 1864, a note was found pinned to the fence of Buckingham Palace, saying: "These commanding premises to be let or sold, in consequence of the late occupant's declining business." Eventually, public opinion forced the Queen to return to London, though even then she preferred to live elsewhere whenever possible. Court functions were still held at Windsor Castle, presided over by the sombre Queen habitually dressed in mourning black, while Buckingham Palace remained shuttered for most of the year. Piano nobile of Buckingham Palace. A: State Dining Room; B: Blue Drawing Room; C: Music Room; D: White Drawing Room; E: Royal Closet; F: Throne Room; G: Green Drawing Room; H: Cross Gallery; J: Ballroom; K: East Gallery; L: Yellow Drawing Room; M: Centre/Balcony Room; N: Chinese Luncheon Room; O: Principal Corridor; P: Private Apartments; Q: Service Areas; W: The Grand staircase. On the ground floor: R: Ambassador's Entrance; T: Grand Entrance. The areas defined by shaded walls represent lower minor wings. Note: This is an unscaled sketch plan for reference only. Proportions of some rooms may slightly differ in reality. The palace measures 108 metres (354 ft) by 120 metres (390 ft), is 24 metres (79 ft) high and contains over 77,000 m2 (830,000 sq ft) of floorspace. The floor area is smaller than the Royal Palace of Madrid, the Papal Palace and Quirinal Palace in Rome, the Louvre in Paris, the Hofburg Palace in Vienna, or the Forbidden City. There are 775 rooms, including 19 state rooms, 52 principal bedrooms, 188 staff bedrooms, 92 offices, and 78 bathrooms. The palace also has its own post office, cinema, swimming pool, doctor's surgery, and jeweller's workshop. 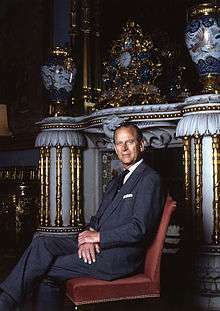 The Duke of Edinburgh seated in the Chinese Luncheon Room, one of a series of Chinese themed rooms on the piano nobile of the east wing. The fireplace, theoretically more Indian than Chinese, was designed by Robert Jones and sculpted by Richard Westmacott. It was formerly in the Music Room at the Brighton Pavilion. The ornate clock, known as the Kylin Clock was made in Jingdezhen, Jiangxi Province, China, in the second half of the 18th century; it has a later movement by Benjamin Vulliamy circa 1820. Directly underneath the State Apartments is a suite of slightly less grand rooms known as the semi-state apartments. Opening from the Marble Hall, these rooms are used for less formal entertaining, such as luncheon parties and private audiences. Some of the rooms are named and decorated for particular visitors, such as the 1844 Room, decorated in that year for the State visit of Tsar Nicholas I of Russia, and, on the other side of the Bow Room, the 1855 Room, in honour of the visit of Emperor Napoleon III of France. At the centre of this suite is the Bow Room, through which thousands of guests pass annually to the Queen's Garden Parties in the Gardens. The Queen and Prince Philip use a smaller suite of rooms in the north wing. Between 1847 and 1850, when Blore was building the new east wing, the Brighton Pavilion was once again plundered of its fittings. As a result, many of the rooms in the new wing have a distinctly oriental atmosphere. The red and blue Chinese Luncheon Room is made up from parts of the Brighton Banqueting and Music Rooms with a large oriental chimney piece sculpted by Richard Westmacott. The Yellow Drawing Room has wallpaper supplied in 1817 for the Brighton Saloon, and a chimney piece which is a European vision of how the Chinese chimney piece may appear. It has nodding mandarins in niches and fearsome winged dragons, designed by Robert Jones. When paying a state visit to Britain, foreign heads of state are usually entertained by the Queen at Buckingham Palace. They are allocated a large suite of rooms known as the Belgian Suite, situated at the foot of the Minister's Staircase, on the ground floor of the north-facing Garden Wing. The rooms of the suite are linked by narrow corridors, one of them is given extra height and perspective by saucer domes designed by Nash in the style of Soane. A second corridor in the suite has Gothic influenced cross over vaulting. The Belgian Rooms themselves were decorated in their present style and named after Prince Albert's uncle Léopold I, first King of the Belgians. In 1936, the suite briefly became the private apartments of the palace when they were occupied by King Edward VIII. Smaller ceremonies such as the reception of new ambassadors take place in the "1844 Room". Here too, the Queen holds small lunch parties, and often meetings of the Privy Council. Larger lunch parties often take place in the curved and domed Music Room, or the State Dining Room. On all formal occasions, the ceremonies are attended by the Yeomen of the Guard in their historic uniforms, and other officers of the court such as the Lord Chamberlain. Since the bombing of the palace chapel in World War II, royal christenings have sometimes taken place in the Music Room. The Queen's first three children were all baptised there. The largest functions of the year are the Queen's Garden Parties for up to 8,000 invitees in the Garden. Formerly, men not wearing military uniform wore knee breeches of an 18th-century design. Women's evening dress included trains and tiaras or feathers in their hair (or both). The dress code governing formal court uniform and dress has progressively relaxed. After World War I, when Queen Mary wished to follow fashion by raising her skirts a few inches from the ground, she requested a lady-in-waiting to shorten her own skirt first to gauge the king's reaction. King George V was horrified, so the queen kept her hemline unfashionably low. Following their accession in 1936, King George VI and his consort, Queen Elizabeth, allowed the hemline of daytime skirts to rise. Today, there is no official dress code. Most men invited to Buckingham Palace in the daytime choose to wear service uniform or lounge suits; a minority wear morning coats, and in the evening, depending on the formality of the occasion, black tie or white tie. Débutantes were aristocratic young ladies making their first entrée into society through presentation to the monarch at court. These occasions, known as "coming out", took place at the palace from the reign of Edward VII. Wearing full court dress, with three ostrich feathers in their hair, débutantes entered, curtsied, and performed a backwards walk and a further curtsey, while manoeuvring a dress train of prescribed length. (The ceremony, known as an evening court, corresponded to the "court drawing rooms" of Victoria's reign.) After World War II, the ceremony was replaced by less formal afternoon receptions, usually omitting curtsies and court dress. In 1958, the Queen abolished the presentation parties for débutantes, replacing them with Garden Parties. The boy Jones was an intruder who gained entry to the palace on three occasions between 1838 and 1841 as recorded by Charles Dickens some 40 years later. In 1982, Michael Fagan broke into the palace twice but, contrary to media reports of the time, did not speak to the Queen. It was only in 2007 that trespassing on the palace grounds became a criminal offence. For more details on this topic, see Garden at Buckingham Palace. 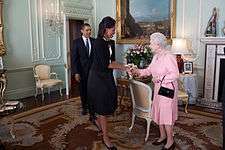 Visiting heads of state are received by the Queen at either Buckingham Palace or Windsor Castle. Here, United States President Barack Obama and Michelle Obama are greeted in the first-floor audience chamber in the private apartments in the north wing. By the Editor: The King and Queen have endured the ordeal which has come to their subjects. For the second time a German bomber has tried to bring death and destruction to the home of Their Majesties … When this war is over the common danger which King George and Queen Elizabeth have shared with their people will be a cherished memory and an inspiration through the years. Every year some 50,000 invited guests are entertained at garden parties, receptions, audiences and banquets. Three Garden Parties are held in the summer, usually in July. 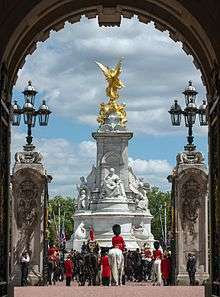 The Forecourt of Buckingham Palace is used for Changing of the Guard, a major ceremony and tourist attraction (daily from April to July; every other day in other months). The palace, like Windsor Castle, is owned by the reigning monarch in right of the Crown. It is not the monarch's personal property, unlike Sandringham House and Balmoral Castle. Many of the contents from Buckingham Palace, Windsor Castle, Kensington Palace, and St James's Palace are part of the Royal Collection, held in trust by the Sovereign; they can, on occasion, be viewed by the public at the Queen's Gallery, near the Royal Mews. Unlike the palace and the castle, the purpose-built gallery is open continually and displays a changing selection of items from the collection. It occupies the site of the chapel destroyed by an air raid in World War II. The palace's state rooms have been open to the public during August and September and on selected dates throughout the year since 1993. The money raised in entry fees was originally put towards the rebuilding of Windsor Castle after the 1992 fire devastated many of its state rooms. In the year to 31 March 2016, 519,000 people visited the palace. Her Majesty's Government is responsible for maintaining the palace in exchange for the profits made by the Crown Estate. In November 2015, the State Dining Room was closed for six months because its ceiling had become potentially dangerous. A 10-year schedule of maintenance work, including new plumbing, wiring, boilers and radiators, and the installation of solar panels on the roof, has been estimated to cost £369 million and was approved by the prime minister in November 2016. It will be funded by a temporary increase in the Sovereign Grant paid from the income of the Crown Estate and is intended to extend the building's working life by at least 50 years. 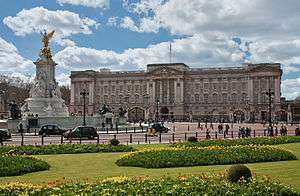 Thus, Buckingham Palace is a symbol and home of the British monarchy, an art gallery and a tourist attraction. Behind the gilded railings and gates which were completed by the Bromsgrove Guild in 1911 and Webb's famous façade, which has been described in a book published by the Royal Collection as looking "like everybody's idea of a palace", is not only a weekday home of the Queen and Prince Philip but also the London residence of the Duke of York and the Earl and Countess of Wessex. The palace also houses the offices of the Queen, Prince Philip, the Duke of York, the Earl and Countess of Wessex, the Princess Royal, and Princess Alexandra, and is the workplace of more than 800 people. ↑ By tradition, the British Royal Court is officially resident at St James's Palace, which means that, while foreign ambassadors assuming their new position are received by the British sovereign at Buckingham Palace, they are accredited to the "Court of St James's Palace". This anomaly continues for the sake of tradition as Buckingham Palace is to all intents and purposes the official residence. See History of St James's Palace (Official website of the British Monarchy). ↑ Royal Household. "Buckingham Palace". Royal Family website. Retrieved 21 April 2016. 1 2 Robinson, p. 14. ↑ "Chapter 1: The Acquisition of the Estate". The Grosvenor Estate in Mayfair. Survey of London. 39. London County Council. 1977. pp. 1–5. Retrieved 3 February 2009. ↑ Goring, pp. 31, 36. 1 2 3 Harris, p. 21. 1 2 "Who built Buckingham Palace?". Royal Collection Trust. Retrieved 8 March 2016. ↑ The Annual Register. 1791. p. 8. Retrieved 25 September 2016. Buckingham-palace was the dwelling house of the king. ↑ Westminster: Buckingham Palace, Old and New London: Volume 4 (1878), pp. 61–74. Date accessed: 3 February 2009. The tradition persists of foreign ambassadors being formally accredited to "the Court of St James's", even though it is at Buckingham Palace that they present their credentials and staff to the Monarch upon their appointment. ↑ "The Royal Residences > Buckingham Palace > History". www.royal.gov.uk. Archived from the original on 28 March 2010. ↑ Ziegler, Phillip (1971). King William IV. Collins. p. 280. ISBN 0-00-211934-X. ↑ "The Royal Residences > Buckingham Palace". www.royal.gov.uk. Archived from the original on 27 March 2010. 1 2 Woodham-Smith, p. 249. ↑ Harris, de Bellaigue & Miller, p. 33. ↑ Holland & Hannen and Cubitts – The Inception and Development of a Great Building Firm, published 1920, p. 35. ↑ Allen's Indian Mail, and Register of Intelligence for British and Foreign India, China, and All Parts of the East. 8. 1850. p. 117. ↑ John Gardiner (2006). The Victorians: An Age in Retrospect. A&C Black. p. 142. ISBN 978-1-85285-560-4. 1 2 3 Robinson, p. 9. 1 2 3 4 5 6 7 8 "40 facts about Buckingham Palace". British Monarchy website. Archived from the original on 4 November 2011. ↑ "Queen honours jeweller with top personal award". Times of Tunbridge Wells. 6 January 2016. Retrieved 2 June 2016. 1 2 Harris, p. 41. ↑ "Visit the State Rooms, Buckingham Palace". Royal Collection Trust. Retrieved 7 February 2016. 1 2 Harris, de Bellaigue & Miller, p. 87. ↑ Harris, de Bellaigue & Miller, p. 135. ↑ Jerrold M. Packard (1982). The Queen and Her Court: A Guide to the British Monarchy Today. Simon & Schuster. p. 48. ISBN 978-0-684-17648-2. ↑ Harris, de Bellaigue & Miller, p. 93. ↑ Harris, de Bellaigue & Miller, p. 91. ↑ John Harris; Geoffrey De Bellaigue; Oliver Millar (1968). Buckingham Palace and its Treasures. Viking Press. p. 90. 1 2 Harris, p. 82. 1 2 Healey, p. 364. ↑ "Royal seal of approval for state banquet exhibition". The Telegraph. London. 25 July 2008. Retrieved 31 January 2016. ↑ Royal Household. "Garden parties: The guests". Official Website of the British Monarchy. Archived from the original on 17 January 2013. ↑ Healey, p. 233, quoting The Memoirs of Mabell, Countess of Airlie, edited and arranged by Jennifer Ellis, London: Hutchinson, 1962. ↑ Anthony Seldon (1999). 10 Downing Street: The Illustrated History. Harper Collins Illustrated. p. 202. ISBN 978-0-00-414073-5. ↑ Peacocke, pp. 178–179, 244–247. ↑ "Mailbox". Royal Insight Magazine. Archived from the original on 23 January 2008. Retrieved 23 January 2008. ↑ Dickens, Charles (5 July 1885) "The boy Jones", All the Year Round, pp. 234–37. ↑ Dugan, Emily (19 February 2012). "Michael Fagan: 'Her nightie was one of those Liberty prints, down to her knees'". The Independent on Sunday. Retrieved 4 January 2014. ↑ "Trespass law targets royal sites". BBC News. 24 March 2007. Retrieved 27 February 2016. ↑ "Buckingham Palace". Archived from the original on 2 May 2008. Retrieved 2009-02-03. (Museum of London.) Retrieved 2 May 2009. ↑ Gold State Coach at the Royal Collection. ↑ "The Royal Residences > The Royal Mews". www.royal.gov.uk. Archived from the original on 10 July 2009. ↑ Nicholson, Louise (1998). London. London: Frances Lincoln. p. 56. ISBN 0-7112-1187-6. ↑ Robinson (Page 9) asserts that the decorations, including plaster swags and other decorative motifs, are "finicky" and "at odds with Nash's original detailing". ↑ "Buckingham Palace hits right note with jazz fans". London Evening Standard. 3 August 2009. Archived from the original on 26 April 2010. Retrieved 11 August 2010. ↑ Rose, Kenneth (1983). King George V. London: Weidenfeld and Nicolson. pp. 176–177. ISBN 0-297-78245-2. ↑ Allison and Riddell, p. 69. ↑ "Letter from Queen Elizabeth to Queen Mary describing the bombing of Buckingham Palace, 13 September 1940". Royal Collection Trust. Retrieved 31 March 2016. ↑ The Sunday Graphic, 18 September 1939, p. 1. ↑ Price, Alfred. The Battle of Britain Day, Greenhill Books, London, 1990, pp. 49–50 and Stephen Bungay, The Most Dangerous Enemy: A History of the Battle of Britain. Aurum Press, London, 2000, p. 325. ↑ "Pilot who 'saved Palace' honoured". BBC News. 2 November 2005. Retrieved 18 March 2009. ↑ 1945: Rejoicing at end of war in Europe (BBC On this day.) Retrieved 3 February 2009. ↑ "Sir Edgar Beck". The Telegraph. London. 9 August 2000. Retrieved 5 June 2012. ↑ Historic England. "Buckingham Palace (Grade I) (1239087)". National Heritage List for England. Retrieved 18 November 2016. ↑ "About Buckingham Palace". Royal Collection Trust. 8 March 2016. ↑ "Changing the Guard". Royal Collection Trust. Retrieved 8 March 2016. ↑ "Royal Property". Parliamentary Debates (Hansard). 252. United Kingdom: House of Commons. 16 January 1995. col. 301W. ↑ "About the Royal Collection". Royal Collection Trust. Retrieved 8 March 2016. ↑ "Windsor Castle – five years from disaster to triumph". BBC. 17 November 1997. Retrieved 8 March 2016. ↑ Royal Collection Enterprises Limited (24 August 2016). "Full accounts made up to 31 March 2016". Companies House. p. 3. Retrieved 19 November 2016. ↑ HM Treasury. "Sovereign Grant Act: frequently asked questions relating to the Act and on general issues". The National Archives. Retrieved 22 May 2016. ↑ Oliver, Sarah (29 November 2015). "Ceiling threatens to fall in at Buckingham Palace: State dining room closed until next summer over safety fears just a month after the Queen took after dinner coffee with president of China". Mail on Sunday. Retrieved 1 December 2015. ↑ Gordon Rayner (18 November 2016). "Queen to remain in residence as Buckingham Palace gets £369m taxpayer-funded facelift to avert 'catastrophic building failure'". The Telegraph. Retrieved 18 November 2016. ↑ "Buckingham Palace to get £369m refurbishment". BBC News. 18 November 2016. Retrieved 18 November 2016.